Wilderness survival gear is often reduced to a Mylar blanket, matches, a compass and maybe a signal mirror. But what about a light source during times of distress and disorientation? The $30 E+LITE, a tiny backup headlamp from Petzl (www.petzl.com), is a new product made to fill the emergency-illumination niche. Petzl designed the E+LITE to be stashed in a backpack and forgotten about until needed. Its lithium battery is said to be good for 10 idle years before use. It is waterproof to 1 sub aquatic meter and weighs almost nothing. In use, the tiny light illuminates a surprisingly large field of view. Its three white L.E.D.s shoot a beam more than 30 feet through the night air. Two power settings control light intensity; an emergency mode activates a blinking strobe. One red L.E.D. on the E+LITE’s face provides a setting that will help preserve night vision. A small lever switch on the front of the headlamp lets you toggle quickly through the light’s multiple modes. The swing motion of the switch — as opposed to the push-button activation found on many headlamp models — prevents accidental operation that could drain the batteries. For winter use, Petzl says the headlamp is good in temperatures down to minus-20-degrees Fahrenheit. The headlamp’s elasticized strap cinches tight on the head. A ball-and-socket-type connection to the base of the light provides pivot. 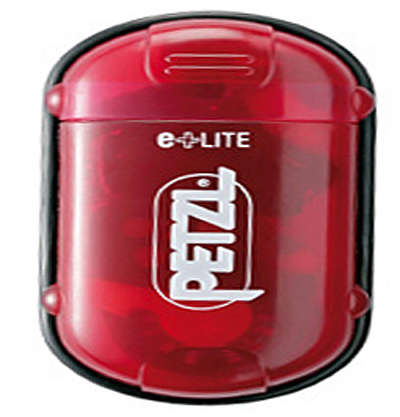 Petzl ships the E+LITE in a hard-shell red plastic capsule that measures 3.5 inches long. I keep my E+LITE in its case and stashed in a small compartment of my backpack when out in the woods. Its weight — which goes at a feathery 46 grams, including case, batteries and light — makes this essential little load all but unnoticeable.